Quinnipiac men's ice hockey senior forward Bo Pieper has signed with the Adirondack Thunder of the ECHL, an affiliate of the New Jersey Devils. He becomes the third Quinnipiac player to sign a professional contract following Tanner MacMaster and Kevin McKernan. Pieper played in 38 games for the Bobcats this season recording 11 goals and 7 assists with a minus 6 rating. This was the second consecutive season in which Pieper had double digit goals scored for Quinnipiac after scoring 13 a season ago. Over his four year career for Quinnipiac, the Roseville, Minnesota native played in 158 games recording 32 goals and 33 assists with a minus 1 rating. The past two seasons he combined for nine power play goals for the Bobcats. He was part of two Quinnipiac teams that won the Cleary Cup for the ECAC regular season champion in 2015 and 2016 along with winning the schools first ever Whitelaw Cup in 2016 as the champions of the ECAC tournament. He also played in the NCAA Tournament twice in 2015 and 2016 with the latter year making it all the way to the National Championship game in Tampa, FL before falling to North Dakota. 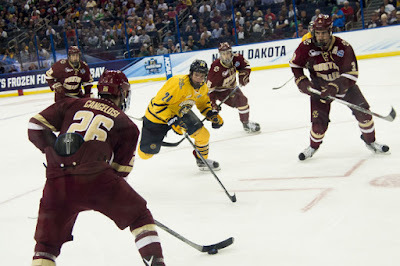 He recorded his lone NCAA tournament point in the 2015 first round loss to North Dakota when he assisted on Quinnipiac's only goal by Andrew Taverner. He also scored a power play goal in the 2016 ECAC Championship win over Harvard. His senior class will leave Hamden with 94 wins during his time as a Bobcat.